Outstanding math skills are a critical education component. In Texas, educators who want to teach math in grades four through eight must take the TExES Mathematics 4–8 (115) test. The exam assesses whether an entry-level educator has the skills to teach math at this level. Teachers will be tested in a wide range of areas including number concepts, geometry, and algebra. This guide provides information about the exam and offers an excellent study guide to help you prepare. How many questions are on the TExES Mathematics 4-8 (115) test? 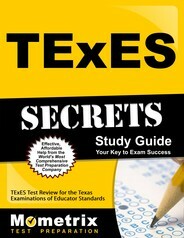 Prepare with our TExES Study Guide and Practice Questions. Print or eBook. Guaranteed to raise your score. Get started today! There are 100 questions on this computer-based exam. How long do I have to complete the test? Since this is a math test, am I allowed to bring and use my own calculator? No. Candidates will have access to an on-screen calculator. Do I have to pay a fee in order to take the test? Yes. The test fee is $116. What’s on the TExES Mathematics 4–8 (115) test? TExES Flashcards. 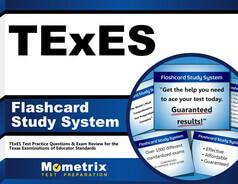 Proven TExES test flashcards raise your score on the TExES test. Guaranteed. The test contains six domains or content areas. These are some of the areas covered in the test. Number concepts test the candidate’s knowledge of number systems structure; computational algorithms; and number theory including how number theory applies to whole numbers, integers and rational numbers, place value, and counting techniques. Patterns and Algebra assesses the beginning teacher’s knowledge in areas that include problem-solving using linear functions; linear function concepts and linear functions, proportions, and direct variations; and the advantages or disadvantages of using linear models. Geometry and Measurement ensures teachers understand concepts that include parallel and perpendicular lines; planes, lengths, and distances; length and perimeter formulas; and two and three-dimensional figures. Probability and Statistics tests the ability to explore data with graphical and numerical techniques; an understanding of the theory of probability; the principals of statistical inference; and the ability to use various techniques, including scatter plots and regression lines, in the area of bivariate data. Mathematical Processes and Perspectives assesses areas that include the educator’s understanding of reasoning and problem solving, including analyzing a set of premises to reach a valid conclusion; and communicating mathematical information using graphs, tables, and diagrams. Mathematical Learning, Instruction, and Assessment. This area covers how children learn math; appropriate and effective lesson planning; math instruction planning strategies; and techniques, both information and formal, to assess math learning. What is the exam’s passing score? Candidates must score at least 240 to pass the test. How can I access my test score? Candidates can access their test scores through your test account. When will my exam scores be available? Test scores should be available roughly two to four days after you take the test. When can I take the TExES Mathematics 4–8 (115) exam? The test is available year-round. The testing centers, however, are closed on certain holidays. Please consult the Texas Education Certification Program website for specifics. A private test company delivers the exam for the Texas Education Agency. There are test centers throughout the state and country. You can do an online search for the test center nearest you. What identification will I need to show on test day? All candidates must show two forms of identification. The primary form of identification must be a government-issued ID with a photo and signature. A driver’s license is fine. You’ll also need to bring a second piece of identification, called a supplemental form of ID, that has a name and photo or a name and signature. When should I arrive at the test center? Make you arrive early because if you’re more than 15 minutes late you might not be allowed to take the exam. Am I allowed to bring personal items into the test room on the day I take the TExES Mathematics 4–8 (115) test? Personal items, including electronic devices and certain clothing items, are not allowed in the test room. It’s best to consult the test policies for a complete list of prohibited items. I’ve always wanted to teach math and need to prepare for this exam. What study materials should I buy? Mometrix offers outstanding study tools. Our study guide contains a study plan, tips on avoiding test anxiety, how bits of information can give away the right answers, and so much more. If you’re pressed for time, our flashcards are the perfect study tool. Take them with you and study anytime you just have a minute or two. You can even ask friends and family to quiz you. These are the study tools you need to prepare for the TExES Mathematics 4–8 (115) test.